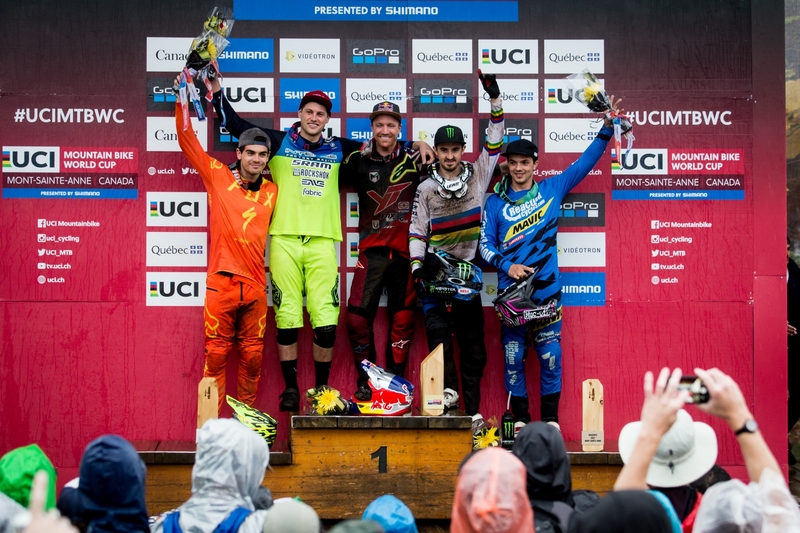 The UCI World Cup made its penultimate stop for 2017 at the legendary venue of Mont-Sainte-Anne near Quebec in Canada. This was the site of Aaron Gwin’s first ever World Cup race, 10 seasons ago, where he finished an impressive 10th place. This year, like many years at this venue, weather played a huge factor with the rain hitting the mountain with most of the top riders yet to finish. 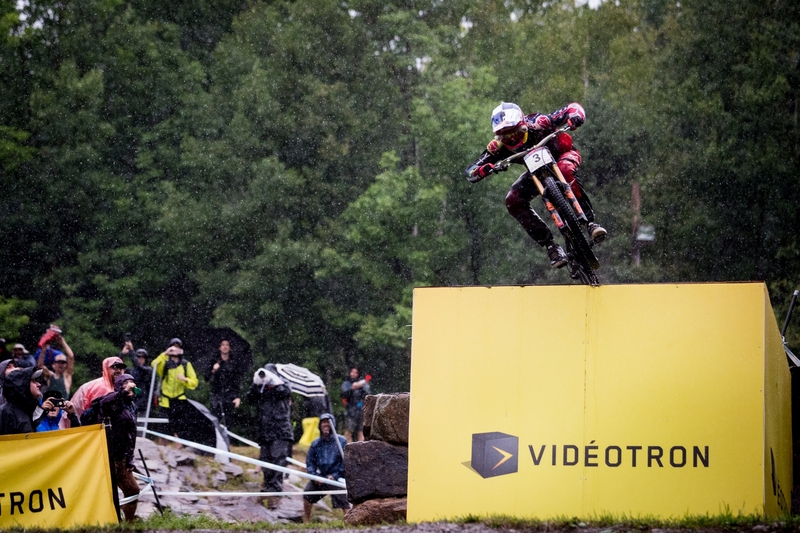 Unlike the opening round in Lourdes however, the rain didn’t cause the riders to lose massive amounts of time and in fact hardly anyone crashed in the super wet conditions. It was more an issue of visibility and dealing with the standing water on the track. Australian Dean Lucas found himself in the hot seat prior to the 20 minute break for TV, and around that time, the rain increased from a drizzle to a downpour. Many of the on-site fans thought the racing was over with most riders battling to get within 10 seconds of Lucas’ time. That was until his teammate Jack Moir (AUS) put in an incredible run, finding time in the 3rd sector, and crossing the line in 4th place. At that point the team radioed up the mountain to inform Aaron what had taken place, and that a top time was possible. After Jack Moir came in, Troy Brosnan (AUS) also put down a great run going into 3rd place. It was clear the top guys had a shot. Next up it was Danny Hart (GBR) who was ahead of Dean Lucas until the finish line and he slotted into 2nd before World Cup leader Greg Minnaar (RSA) took to the track. Only 1 second down at the first split, the major surprise came at the 2nd split which showed the South African down by 20secs. An off track excursion had cost him a lot of time, and ultimately a disqualification for an incorrect entry back onto the course. 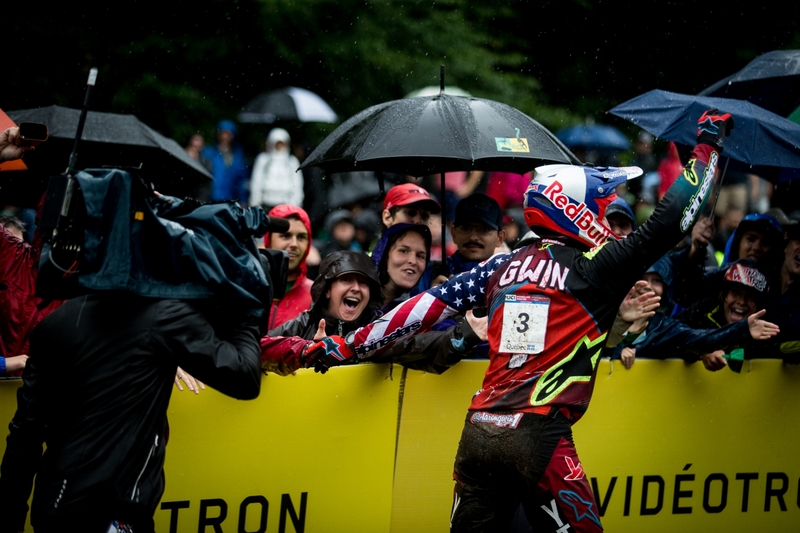 Next up Loic Bruni (FRA) crossed the line for 3rd and so the attention turned to the last man down, fastest qualifier Aaron Gwin who some doubted had the wet weather experience to deal with the conditions. What happened next was simply incredible. Picking up green lights all the way down, at one point 2 seconds up on everyone, Aaron took an historic win in the most extreme conditions. The fact that I’ve been sitting here for 10 minutes now trying to figure out how to start off this quote for our press release should explain my feelings after today’s race. It’s hard to find the words; I’m just happy. It’s been a crazy season but we’ve kept fighting through the ups and downs, and this weekend wasn’t any different. It feels good to get that win. Conditions like we had today make the win feel even better. I’m happy for myself, my team, the sponsors that support us and the thousands of fans who’ve been encouraging me all season. Thanks to all of you for the love. I wanted to take this title fight to the last race, and now we get to do that, so let the fun continue! After Lenzerheide which was the most difficult defeat to cope with, I can honestly say in 18 years of being on the World Cup circuit, today’s victory is the greatest I’ve ever been involved with, truly spectacular. Lucky 13. 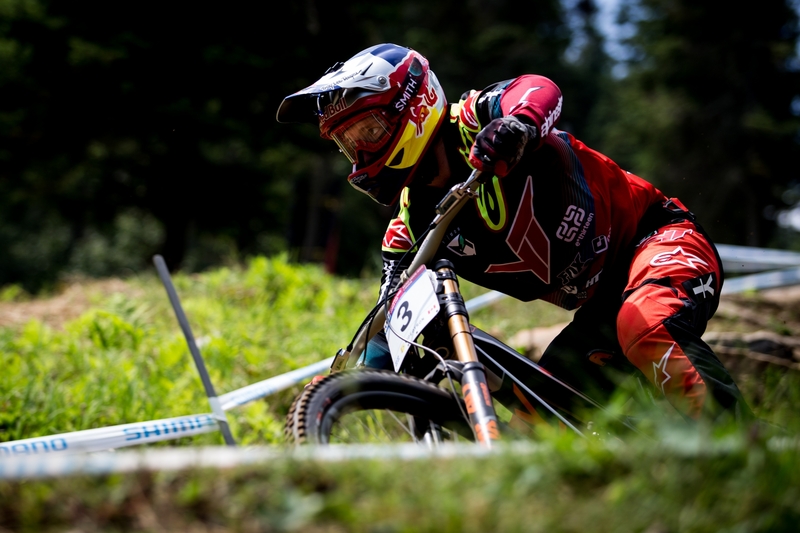 This is the 13th World Cup race for the YT Mob, so 13 turned out to be lucky for us. Aaron likes this number too and keeps any number 13 plate he gets! It’s also his 13th win for 23 Degrees’ race programs, and now his 18th career win in total. In his first race at Mont-Sainte-Anne in 2008 he got 10th place, and now in his 10th race at Mont-Sainte-Anne he gets 1st! The title chase is now just 33 points away from Greg Minnar in 1st, with Troy Brosnan only 44 points behind Aaron. Mathematically only Greg, Aaron or Troy can win the title, and it will all go down to the wire in Vale Di Sole in 3 weeks from now.